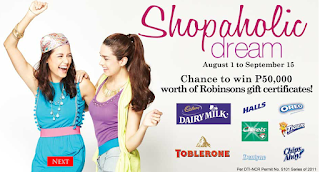 Robinsons Department Store treats you shopaholics to a once-in-a-lifetime shopping spree. We are giving away one hundred thousand worth of Robinsons Gift Certificates from now until September 15. Your P1,000.00 single receipt purchase across departments inclusive of at least three hundred pesos worth of Cadbury, Toblerone, Halls, Clorets, Dentyne, Oreo, Tiger and/or Chips Ahoy products entitles you to one (1) raffle coupon. So what are you waiting for? Shop now for a chance to shop more! See mechanics posters for complete details!